Remember that saying: find a penny, pick it up, all day long you'll have good luck? As a child I chanted this little rhyme without any idea of the power behind the words. As I grew up, this rhyme resurfaced many times but I never actually did it -- pick up pennies. It was the judgment of others that kept me from doing so. Bend down in the middle of a sidewalk to pick up a coin worth only one cent? Wouldn't that tell others I was cheap or poor or desperate for cash? In college I met a friend who spurred a change in my thoughts about this. We were leaving her home to head downtown for a night of clubbing; while walking to my car parked in her driveway she suddenly stopped, mid-conversation, and bent down toward an object glinting in the moonlight. A penny. She picked it up, touched it to her forehead with her eyes closed, brought it close to her lips and made a kissing motion. Just as seamlessly, she tucked the penny into her jeans pocket and continued the conversation. Slightly embarrassed for her, I chose not to say anything. I didn't want to call attention to the fact that she had just picked something up from the ground, for heaven's sake, and then treated it like some kind of treasure. But something about the holiness of the act tugged at me that night under the moon in her driveway. I wanted in on this intriguing ritual. Now that I wanted to play the game I was finding pennies everywhere. Self-consciously at first, and only when alone, I'd swoop down like an eagle on its prey, scoop up the coin, make an inconspicuous sweeping gesture somewhere in front of my chest, and then shove it into my pocket. Not quite with the reverence of my college friend. What did I do with the pennies? At first, a great many ended up in the washing machine. The new practice hadn't quite cemented itself into my way of life. Eventually my awareness grew and the coins ended up in my wallet, allowing me to give exact change to a cashier. One time they even afforded me enough gas to turn the darn gas light off (this was obviously a long time ago.) But the magic didn't show itself to me until I set the intention to collect stray coins for the sole purpose of benefiting others. Once I did that, my eyes caught not just the copper of the penny, but the glistening silver nickels, dimes and quarters. We started a charity jar at home and that's where the day's treasures went. When the jar was full, we rolled the coins and gave them to Pennies for Peace. I understand that I have a right to the money, and so does everyone else. It's not mine or theirs, it just comes and goes. That's why it's called current-cy. It's an energy and as such, it must move. Now I don't wait for a jar to be full, or for the right moment to present itself. If I've got change in my pocket, I can use it now to put a smile on someone's face. It's amazing how little it costs, both in time and money, to lift someone's spirits. Here's the thing: We turn our noses up at certain sums while deeming others worthy enough to destroy our families, our friendships, our integrity, our honour. Indeed, there is even a value out there great enough for us to hand over our soul to the devil. 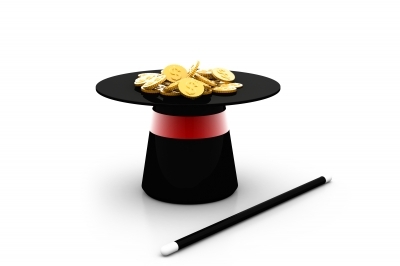 We totally miscalculate the magic behind the penny -- what its value truly is. People's relationships with money are weird and varied. Money keeps people up at night, holds them back from their dreams, makes people feel down and worthless. Some people hold on to money so tight, I can almost hear their knuckles crack each time they are forced to pry their fingers open and part with a little. Yet, others are quick to throw their fingers open to receive money in all kinds of ways that demoralize us as true magic-makers. The magic rests behind this principle: Pinching pennies for one's own gain while turning a blind eye to the needs of others keeps us further behind in our ability to achieve true abundance. While I may be capable of doing wonders with mere pennies (like using them to buy a street person coffee), I am not the Master Magician. Rather than spending my days meditating on the hows and whys of this phenomenon, I choose to accept that it exists and keep my eyes peeled for shimmering objects in the moonlight. Equally important, or perhaps more, I keep my heart open for creative ways in which to pay them forward. Find a penny, pick it up, all day long you'll have good luck? Yes. And so will the person you decide to share it with.